10 days ago Greg and I traveled to Iceland and while I don’t normally do travel blogs this trip, this country, was so spectacular I simply have to write about it! It was a quick trip. We departed Thursday night on the red eye, and returned Sunday late afternoon. Iceland is a country that caught the world’s attention in 2008 as three of their largest banks collapsed. (which I happened to blog about long before I ever considered going) The financial crisis took a serious toll on their economy, though as a tourist visiting in 2012 you would never know it. Relative to the size of Iceland’s economy (2011 GDP $12.3 billion US around $13 trillion!) their banking collapse was the largest suffered by any country in history (read more about it here.) What is crazy is how small of a country it is! There are only about 320,000 people and the land mass is about the size of Maine. The trip was organized by Mountain Taxi . If you are planning a trip to Iceland I highly recommend you book with them. They were fantastic. The first day, before we even had the chance to get settled in to our hotel, we were whisked away in “super jeeps” which took us to rugged and expansive lave fields which we toured on ATV’s! We took the ATV’s to one of Iceland’s most popular attractions The Blue Lagoon (pictured above) where we had lunch and soaked in the geothermal waters. Saturday was action packed with more sight seeing and adventures, we got to see the second largest glacier in Iceland (Long-Glacier) and took snowmobile rides across the frozen ice fields! I did manage to come close to killing myself after launching my snowmobile over an unseen hill but hey, I survived. Did you know how much head injuries bleed? After a morning of riding the frozen lands (and getting bandaged up), we were treated to lunch which was served on an ice bar carved into the side of the glacier. (This was a ‘ you are kidding me ‘ moment!). After visiting an amazing falls it was a long drive to our hotel and an amazing dinner with dear friends. Our last day we actually got to go up onto the glacier with ice crampons and ice picks which was an incredible sight! Coincidentally, this was the same glacier that was featured in the film “Chasing Ice” that we just saw at the Sundance Film Festival this year. The filmmaker uses time lapsed photography to capture the melting of the glaciers to provide evidence for global warming. This is a must see film and so cool that you can actually visit that glacier. After an amazing lunch it was back to the airport for home. Greg and I have never done anything like this and to say it was an experience of a lifetime would be an understatement. It was for a VERY special occasion and we were so honored to be included. Iceland is only about 40,000 square miles and it is almost completely bare of tress and vegetation. Exploring on the lava fields I felt like I was on the moon! 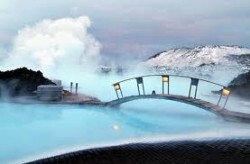 The lava fields and lagoons produce geothermal energy which is one of Iceland’s most powerful natural resources. Geothermal and Hydropower plants are Iceland’s most vital resource and they provide nearly 80% of the nations total energy. Due to its sprawling bare land they are unable to raise large farm animals for their diet. They also have very, very strict rules around livestock which I want to learn more about. The country is known for its fishing and while we were they we definitely figured this out! The popular fish of choice? Salmon, salmon, and more salmon! Iceland is also known for their lamb and dairy products. Though we clearly ‘did it up’ you certainly don’t have to to enjoy this amazing country. It would be spectacular to just travel by car and take in the amazing landscapes. Hiking, biking, skiing and horse backed riding are all very popular. (they have about over 100,000 horses on the island I was told) Visit Iceland!